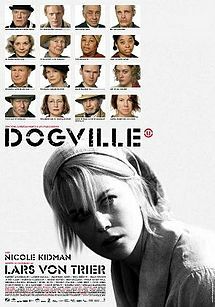 Lars von Trier’s films are usually highly divisive (for the people working on them as much as the people watching them) but I have to say I love Dogville. Perhaps love is the wrong word for so brutal a film but I just find it so fascinating in the way that it exposes humanity for who we really are and the depths to which we too easily sink in the name of self-interest. Visually it is unique as it strips away all the artifice of the film set to leave nothing but chalk outlines of the scenery of the Colorado mountain township of Dogville where the story takes place. Such a bare staging heightens the theatricality of the piece and also its nature as a parable, one that those who dislike the film seem intent to ignore, an irony von Trier would certainly relish. Nicole Kidman’s Grace is a young woman who finds herself at the mercy of a group of townspeople as she’s hiding from some gangsters who are hunting for her. In return for their assistance, she is forced to win over the acceptance of every single one of them through some form of labour but the act of welcoming a stranger into their midst and obliging her to fulfil any whim has a toxifying effect which is utterly life-changing for all concerned. It’s not an easy watch by any means but great art rarely is, it is thought-provoking and different and shocking and memorable. Give it a go, you might just be surprised.